The Sans Souci Literary Institute is located along Ramsgate Road in the southern suburb of Sans Souci. It was built in 1920 in the Federation architectural style as a community building with a library, meeting room, kitchen, office and two small halls. It was a place where where billiards, housie or bingo was played and dances were held. The hall is still used as a community centre. Incredible. My husband's grandparents had friends whose farm was called Sans Souci. And I never knew where they'd got the name. Now I do! Jo, the suburb was named after Sans Souci, the summer palace of Frederick the Great, King of Prussia, in Potsdam, near Berlin. Amazing that nearly 100 years later it is still being used as intended. 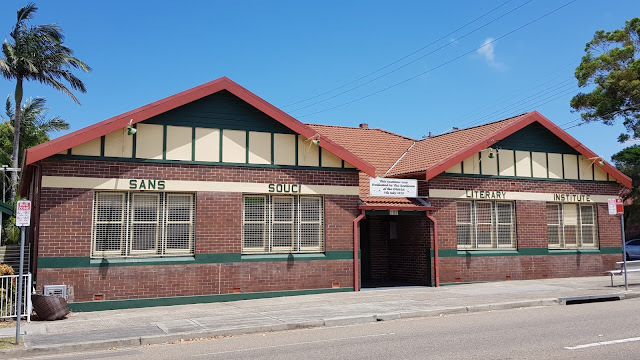 I have tried to visit and photograph as many of the Mechanics' Institutes all around SE Australia as I can. Sans Souci Literary Institute sounds very similar, in both function and architectural appearance. That is some name, appropriate I hope. Very interesting. Nice building and still used for the same thing after all these years. Looks like a sturdy building. It looks a bit formidable, but how neat that it is still in use as intended.